Do you offer programs for academically gifted students? Where are camps located on campus? What time does summer camp start and finish? How much math does my child need to know? What kinds of safety measures will be employed during project construction? What is the Minor's Policy for UNCW? In simple terms, engineers identify a problem and come up with a solution, often creating something completely new in the process. Engineering is a natural fit for children because they are born problem solvers and are curious about the world around them. Engineering also encourages students to see how math and science can be relevant to their lives by applying it to authentic problems. 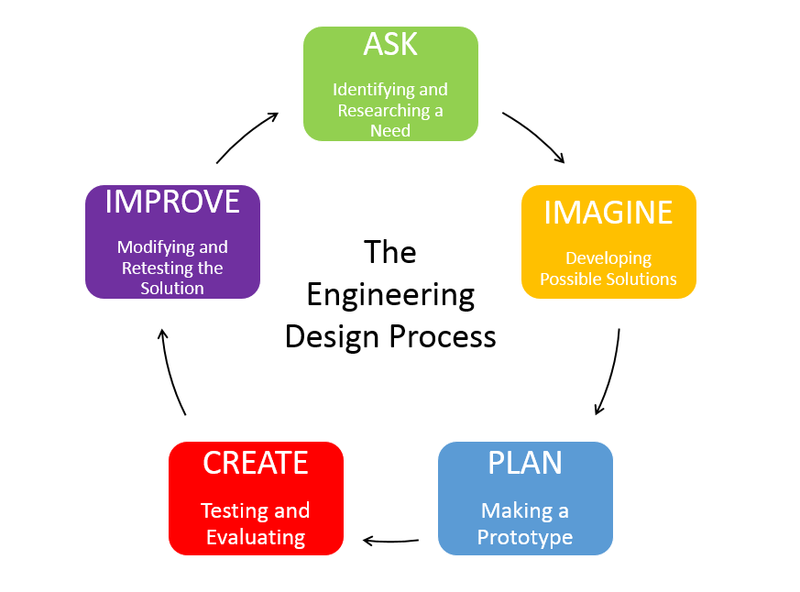 We lead students through the engineering design process (featured to the right) to develop their solutions. All of our programs are considered academically challenging. More importantly, they require participants to be highly motivated. We welcome all students who are seriously interested and willing to do their best. To determine whether your child is suited for our program, see our Talented and Gifted Guidance document. All summer camps begin promptly at 8:30 a.m. The half day programs end at 12:00 p.m. The full day programs end promptly at 3:30 p.m. If you are going to be more than a few minutes late to drop-off or pick-up please call and let our instructors know so they can plan accordingly. Criminal background checks are performed on all staff. At least one instructor in each camp will be certified in First Aid. All of our staff have an educational background in the content area appropriate to the camp. The lead instructor (usually a certified classroom teacher) will have prior experience working with children. Due to the level of programming support required for the robotics projects, we maintain a 1:5 instructor to student ratio. For general engineering camps, we maintain a 1:8 instructor to student ratio. Campers are not allowed to roam the facilities alone. Except for when they are in the bathroom, campers will be in the company of an instructor. Parents (or other designated adult named in your confirmation paperwork) must sign their child in with the instructor at the beginning of camp and sign them out at the end of the day. We base our curriculum on grade level standards that are appropriate for the lowest age we allow to enroll in the camp. Any new math skills we find necessary for engineering projects will be taught during the camp. Instructors will teach campers how to appropriately use any necessary tools. Safety goggles will be worn whenever necessary. Staff has first aid training. Please visit our Minor's Policy page for more information. For any further questions, please contact our Youth Programs office by emailing us at ypengineers@uncw.edu or calling us at (910) 962-2640.